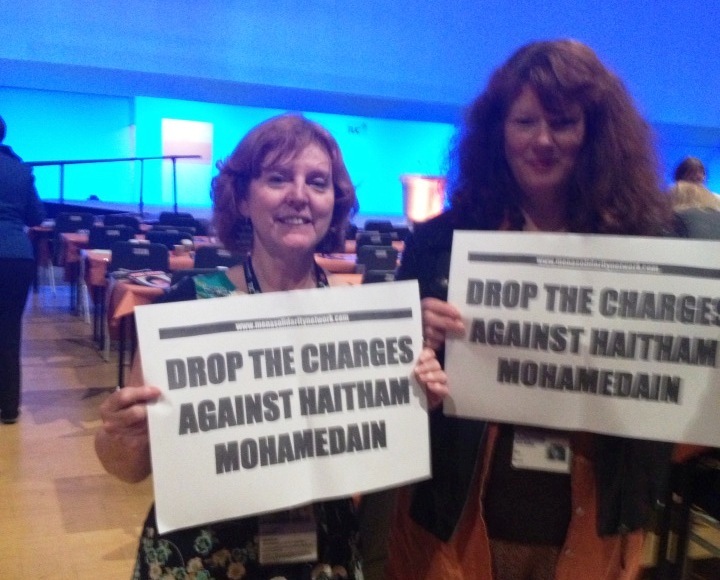 Dozens of trade union leaders signed a statement in solidarity Haitham Mohamedain, the Egyptian labour lawyer and revolutionary activist who was arrested last week, during TUC Congress in Bournemouth. Activists from MENA Solidarity also raised the crackdown on Egyptian revolutionaries, opponents of the military government and the workers’ movement on the floor of Congress. Sue Bond, from PCS union spoke to delegates on Wednesday morning during questions to the TUC General Council on its report. “I emphasized how the Egyptian revolution was a beacon of hope for millions around the world who were inspired by its slogans of bread, freedom and social justice,” she said, “but I thought it was crucial that delegates should know that recent events threaten to turn back the clock to the Mubarak era, particularly as the TUC has been active in solidarity campaigns for the independent unions in Egypt. Write urgently to the Egyptian authorities calling for an end to the harassment and prosecution of the military’s political opponents. Rush messages of protest to General Abd-al-Fattah al-Sisi, Commander in Chief of the Egyptian Armed Forces. Email General al-Sisi here mod@afmic.gov.eg copy in Kamal Abu Aita, Minister of Labour (minoffice@mome.gov.eg) and the Egyptian Ambassador to the UK (eg.emb_london@mfa.gov.eg) or your country.